This was a fun race to watch. The runners started one minutes apart, with the slowest times from Stage 1 starting first, and the fastest starting last. I was taking care of the first water station as the 3k mark along with Lahring and her 2 friends. There was great speculation as to when the first runner would arrive and whether the train would cross the route before they arrived. Turns out it was the CN people checking the signals and there was not train scheduled. Thanks goodness. It was approximately 25 minutes from the starting gun till the first runner came in site. We found out later that the race had started later than planned. The 40 runners all sped past our station in approximately 25 minutes. They were already 'catching' each other. This year the race bibs have the runners name along with his/her number. It much more fun to call out their names along with encouraging words and directions. The runners have also told me that they love hearing their names called out. Once we packed up our gear, we headed back to the finish line, that was right next to the starting line. We were in time to see the leader (who was the last to start) blast past the pack and cross the finish line in a blistering 50ish minutes. You really must go to the Endurrun site and watch today's video. Check yesterday's blog entry for the web address. I did take a book with me to release. 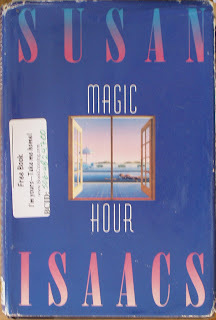 "Magic Hour" by Susan Isaacs. The main character is a police detective who happens to be a 5 mile a day runner. I felt this would be a perfect book for a themed release. Unfortunately this book was not 'caught', so I'll take it along to Stage 3 tomorrow. Thanks for checking in to read about today's adventures.